Karndean - anyone got experience of laying it? I’m thinking of laying Karndean ‘wood’ planking flooring in the boat. There seem to be a couple of possibles suitable for diy laying - Looselay and Korlock. My problem is that though the subfloor is very solid and basically flat (25mm ply) each side slopes slightly toward the centre line - about 8-10mm height difference. The local Karndean flooring shop started talking about screeding at which point I gave up with them. Anyone had any experience of laying the stuff? You can't lay it over the center joint if it is not completely flat, it will crack. You could put a wood strip down the center and lay both sides. You can screed it level with self levelling latex screed. I'll be using lvt when I get to doing my floor - it seems perfect for a boat. I suggest you lay the floor in such a way that the pattern works with any joins in the floor that you have - I have plenty of joins because I have it in sections that will still be easy to lift once the floor is down (incase I need to reballast or check bilge). Why not start laying your planks from the centre line (iether width or length ways?) and make a feature of it. You could do a strip either side following the line, then do the rest at 90 degrees? And another length ways run of planks either side of the boat. You might have to take plank sizes into consideration in order to keep waste to a minimum and to make life as easy as possible, so a good bit of thought and planning first. It's a good opportunity to make sure you do have at least some liftable sections. Just to add - you'd really need to go for glue down if you have liftable sections. No... But every time I've discussed it with any flooring shop they say it must be screeded level then stuck down. We have a version in our office that didn't need screeding or glueing and it's shite! Try Karndean Palio click. It has all the advantages of karndean but you can lift it up if you need to. Used it several times and is totaly plastic and hardwearing. Try Karndean﻿ Palio click﻿﻿﻿.﻿﻿﻿﻿ It has all the advantages of karndean but you can lift it up if you need to. Used it several times and is totaly plastic and hardwearing. We have some of it at home by the front door and it is very hard wearing, but it is stuck down to the concrete floor. We had normal Karndean put down at home last year. Screed levelled floor by builders. Then circa 8 weeks drying time later (the Karndean shop came round and measured the dryness three times during this 8 week period) the Karndean fitters arrived put down self levelling compound on day 1 and day 2 glued down the Karndean. Can you ensure the sub base is dry on bote floor. Self levelling compound on a bote that will prob be listing? Karndean is great....... in a house. I would think retrofitting Karndean on a floating boat could be problematic. I'll be using lvt when I get to doing my floor - it seems perfect for a boat. I was thinking of a laying pattern a bit like you suggest - looks good in the photo. But what's 'lvt'? Yet another Karndean or a mis-type? I hadn't heard of this one - the Karndean website is utterly uphelpful; it doesn't give any info on Korlock or Palio Click but the various styles are there when you search. The big question - does it stay down ok? And what keeps it down? 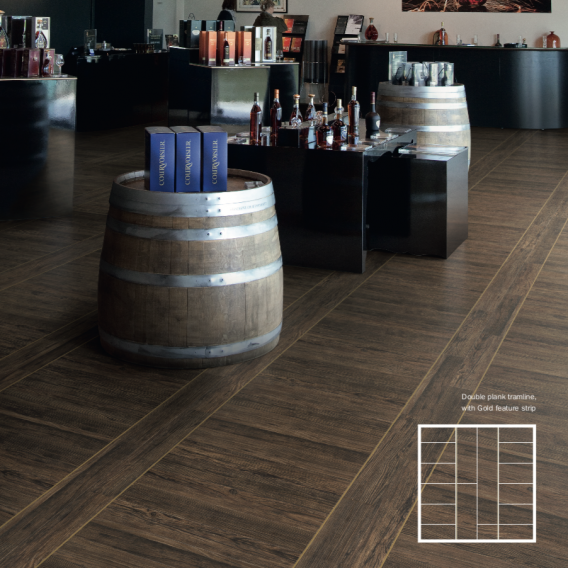 LVT is Luxury Vinyl Tile -- the generic term for this sort of material. Just laid the bathroom floor at home with some vinyl planking from B&Q. It latches on all four sides and is mildly flexible to cover imperfections. It is recommended for all applications except wet rooms. It looks a treat, and is warmer than wood and there is nothing to delaminate. At £30 per sq.mt. it is not the cheapest, but latching on all four sides, it will never start to separate. More of a problem is that most narrowboats sit bow high so the screed will run towards the back of the boat and into your carpet and underlay. Dont ask how we know this! I've done vinyl click plank flooring in 2 rooms directly over chipboard sheet floor. Good to lay, locks together well, water resistant, requires no fixings or glue, non slip, looks really good. However, these planks are plastic and therefore need a 5-10mm allowance for expansion in the home where the temperature varies by maybe 5 or 10 degrees max. I'd like to do my boat and I think it would be perfect except that the temperature range there can easily be 25 degrees. I'm not convinced that it can accommodate that without unsightly expansion gaps around the edges - or something equally unsightly covering said gaps. I hope someone knows better, cos my carpet will then be gone in a flash! 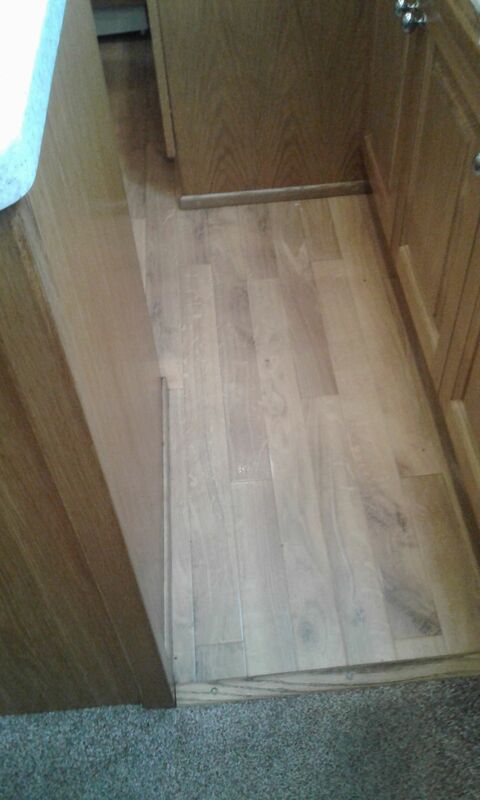 We had a solid oak floor in the kitchen on our boat but got fed up with rubbing it down and revarnishing, it being a through kitchen. So we pulled it up and had Karndean fitted just over 2 years ago.They put down waterproof mdf on top of the ply then filled the joins. It looks great and matches the oak of the kifchen units. As the original floor had a skirting I put a new one on. There is one joint that has opened. 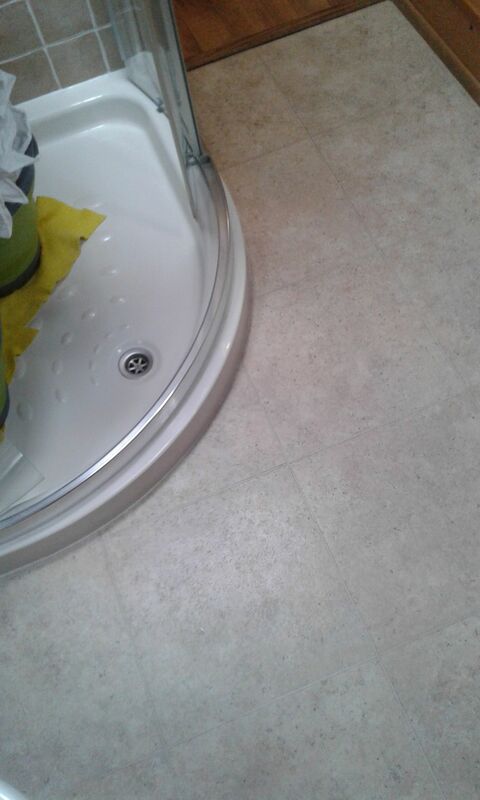 It looked so good that we had Karndean laid in the bathroom. This had ceramic tiles laid but one of the grout lines running acrossvthe boat would continually open. Strangely, or not so, the same artificial grout line on the Karndean opens up. I think this is because of longitudanal expansion as it closes in winter and opens in summer. Even so, the gap is only about half a millimetre. One other advantage of Karndean and presumably other makes of LVT is that if you damage a plank or tile,mit can be easily replaced by warming with a heat gun and lifting the damaged one up. Karndean can scratch. Person I know advised me of that. But I've seen no evidence on ours to date at home. We are quite careful however. The biggest damager of any flooring is grit underfoot so if you kick your shoes off and don’t tramp gritty mud around it should last well. We were advised against having real wood in the hall at home but like you we’re careful and the very hard lacquer finish is standing up well with zero noticeable damage after over a year. As﻿ the original floor had a skirting I put a new one on. Thanks. That's an option, of course, and yours looks nice too, but I like the clean lines I have without that at the moment. Food for thought though - thanks for sharing.